Will Russell Martin prove to be the missing ingredient? Veteran catcher Russell Martin is back in the saddle with the Los Dodgers Dodgers. He was once part of the most memorable Canadian dynamic duo, with former Dodgers closer Eric Gagne. The pair had their hey-day back in the early to mid-2000’s – when Gagne would take the field to close out a game, the words “Game Over” would flash across the scoreboard and the PA system would play the song “Welcome to the Jungle” by Guns N’ Roses. After a victory, another tradition found myself and another reporter on the field after post-game interviews singing “O Canada,” the national anthem of Canada, to honor the one-two punch of Martin and Gagne. Martin, a four-time All-Star, who was drafted by the Dodgers in 2002, was traded from the Blue Jays shortly before the start of Spring Training 2019, and just a day after the team lost free agent catcher Yasmani Grandal, to the Milwaukee Brewers. In order to obtain Martin, the Dodgers had to give up minor league prospects shortstop Ronny Brito and pitcher Andrew Sopko. The Dodgers also received $16.4 million in cash from the Blue Jays and Martin will earn $20 million this season in the final year of a five-year, $82 million contract. Martin, 36, struggled last year, batting a career-low .194 in 90 games. His best years were with the Dodgers from 2006-10 when he hit .272 and helped lead them to three postseason appearances. Currently, after six games played, he’s boasting a .333 batting average with five hits, one home run, seven runs, and two RBI in 15 plate appearances. So far, the investment in Martin is already paying dividends. 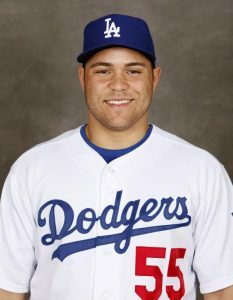 He is rising from the ashes like a Phoenix and the Dodgers are appreciating his veteran presence and leadership skills. Not only is Martin providing his services as a catcher, he also got the nod to enter one game as a pitcher. The score was 18-5, the Dodgers blowing out the Diamondbacks in the third game of the Home Opener Series. With three outs to go heading into the ninth inning, manager Dave Roberts handed the ball to Martin and he managed to retire the side throwing only eight pitches. Not bad for his first time pitching in the majors. Martin’s 1-2-3 ninth inning performance was the first by a full-time position player since 1925, and also a first to close out a win since Willie Smith did so for the Tigers in 1963. “I played against him when he was a young rookie. Played every day; when he didn’t start at catcher, he played third base. He was kind of this gritty guy you didn’t really like from the other side but loved his athleticism,” Roberts said. This entry was posted in MLB, Uncategorized and tagged Eric Gagne, la dodgers, mlb, Russell Martin. Bookmark the permalink.